Today, I illustrated a boat. I was going for a cartoony look, but my style doesn’t lend itself to exaggerated proportions, varying outline and flat color, so I turned to software for help. 1) I sketched a boat in an angle I thought was dynamic. I used a ball point pen. 2) I sketched the boat from the sketch using a pencil and broke it down into shapes and exaggerated those shapes. 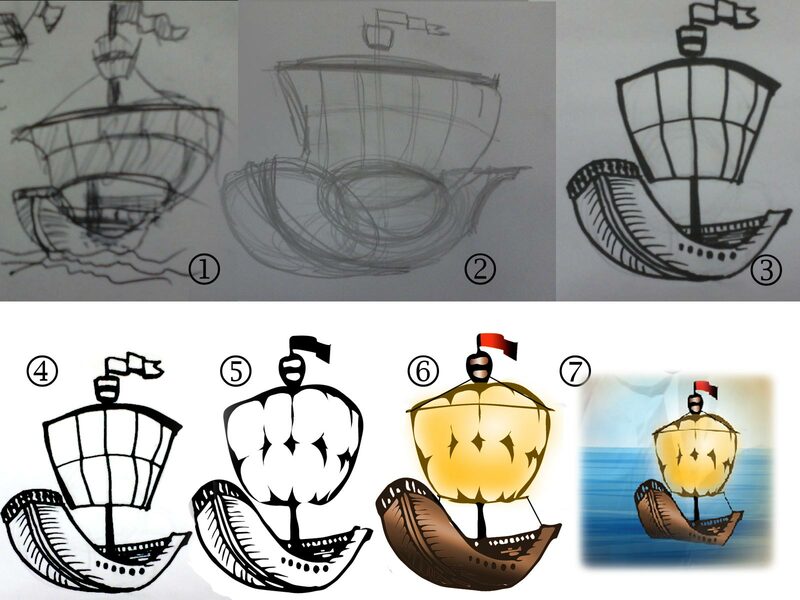 3) I sketched the boat again using pencil, modifying the proportions, and then outlined the boat with a Sharpie. 4) I used Photoshop (Levels) to clean up the sketch, so that it is a black and white outline. 5) I did what most Designers and Illustrators say not to do, I used the live-trace/image trace feature. Then distorted what I had. 6) I used gradients, clipping masks, and hue/saturation masks to color the outline and the fill separately. 7) I put the boat against a background. And there you have it. Now go be the cartoonist Adobe knows you to be.